WRAP YOUR PIPES— A Busted pipe is an unwelcome guest, no matter the season. To avoid a bad situation, drain and disconnect your hoses, wrap exterior pipes and install faucet covers to protect your spigots. Also, if you don’t have central heat, you may want to consider wrapping interior pipes—especially those on exterior walls. PREP THE PLANTS— Bring any warm-weather plants indoors or to the garage so they have a fighting chance to survive the winter. (This is assuming you haven’t already killed them off over the summer, like I have.) Add mulch to your flower beds to create a warm “blanket” for the plants. It’s also a good idea to have a few blankets or towels ready for your most delicate plants, in case we have extended freezing temps. TURN IT BACK— Be sure your ceiling fans are set to spin clockwise. Hot air rises, so the “cold weather” fan setting distributes the hot air back down. Most fans have a switch that changes the direction of the blades. CHIMNEY SAFETY— Before you snuggle up and light that first fire of the winter, be sure to check your chimney for buildup. If you use it regularly, have it professionally cleaned before you start using it. Chimney fires are preventable with regular cleaning. While we are on the subject of fires…when was the last time you checked out the batteries in your smoke detector? While you’re at it, go ahead and get some extras for the TV remote too—arguably the most important batteries in the house during winter! AVOID DRAFTS— Cold drafts coming into your house can mean some annoyingly cold nights that can have big impacts on your utility bill. To find the hidden drafts, light a candle near each door/window. If the flame flickers (or if you suddenly feel a cold breeze go up your robe), then you’ve got a draft. Seal all openings with caulk or with weather-stripping. FILTER CHANGE— Let’s end with an easy one, shall we? Be sure to change your HVAC’s air filter. It will help your system run more efficiently (which will save you moola!) and cut down on allergens. 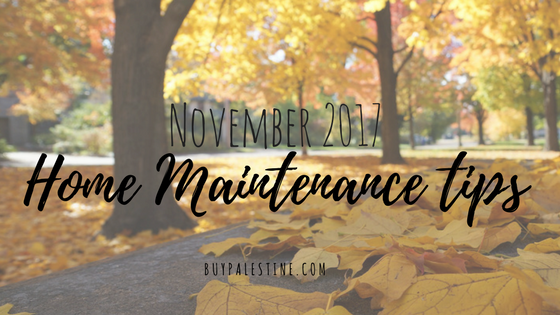 Luckily, November isn’t only filled with maintenance tasks—there’s turkey and gravy too! Here’s to a great holiday season and a happily maintained home! Lisa E. Priest loves Thanksgiving dinner with all the fixins and is a Real Estate Broker / REALTOR® with Picket Fence Realty, Inc. You can reach her via phone or text at 903-948-3343 or read more at BuyPalestine.com.